I am like the Tiger Woods of the Drugstore Game – Mommin' It Up! I haven’t written about my love of coupons and my lust for sweet deals in quite awhile, and I decided it was time to rectify that. Recently, despite some setbacks in the CVS area, (one of my fave stores no longer takes competitor coupons and the other one no longer takes internet-printed competitor coupons!) I have kind of ramped up my couponing. I am now quite proficient at Rite Aid’s single check rebates program and I’ve been working the Walgreens register rewards a wee bit as well (a lot bit this week!) And this week I got a sweeeeeeeeet deal on Venus razors and Olay body wash at Target and I now have $15 of Target gift cards burning a hole in my pocket! 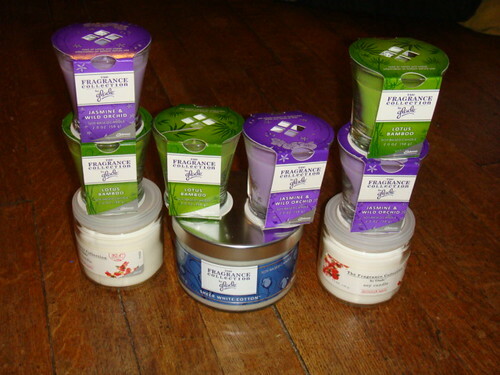 And lucky for me, Walgreens had my *favorite* Glade soy candles on clearance this week! The little ones were just $1.74 each and I had several $3/2 coupons! Soy candles for 24 cents each? Yes, please! I also got paid $1.50 (each) to buy 2 bottles of Dove Men’s body wash at Walgreens, (gotta keep the hubs smelling fresh!) and got a few packs of Huggies diapers for about $2.50 a pack, got some “feminine hygiene” products for about 75 cents a box, and still have some register rewards to spend. WHEEEE!! With tax I paid $6.54, and I’ll get back $1 for the Gillette, $1 for the NyQuil, and because of earlier spending plus this order, a $15 Visa gift card from P&G. LOVE IT!!! 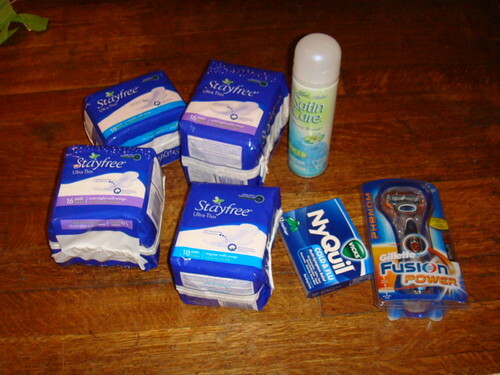 Also, I now have enough feminine hygiene items to last until menopause!! It’s like Fort Kotex in my bathroom cabinet! All of this drugstore fun combined with the Daytona Event promotion at Kroger this week, and I was truly in coupon heaven! I wish I had taken pictures of all my purchases this week so Emily could well & truly make fun of me, but you’ll have to take my word for it! It was EPIC! You did awesome!! *LOVE* the Fort Kotex! LOL I managed one transaction at Walgreens this week, but didn’t get nearly as much as you did! From the Tiger Woods reference down to Fort Kotex–loved this post. I wish I could be as good at scoring coupon deals as you!! Jenny was kind enough to give me one of the Glade candles and it is wonderful! Thanks so much! 🙂 Can’t wait for you to teach me more! I was so upset about CVS not taking competitor coupons! It was fun while it lasted. You kill me, Fort Kotex. Our Walgreens is soooo close to opening. Seriously, the folks there know me already! Someday, Jenny, I hope to score deals as good as you! It’s an obsession! I wish I was as dedicated as you with the coupon thing!!! Previous PostPrevious Giveaway: Ringling Brothers Zing Zang Zoom!